Pentamatic ‘Right Angle Finder’ for low angle and close-up photography. This simple finder mounted securely to the camera’s eyepiece and had adjustments for focus and could be rotated 90 degrees to the left for vertical copy work. The image is reversed so it does require some getting used to. Here it’s mounted to our Pentamatic-S.
A small collection of boxes gives some idea as to the diversity of the early accessories. Note the general theme of the design… each shows off the pentaprism design of the camera. 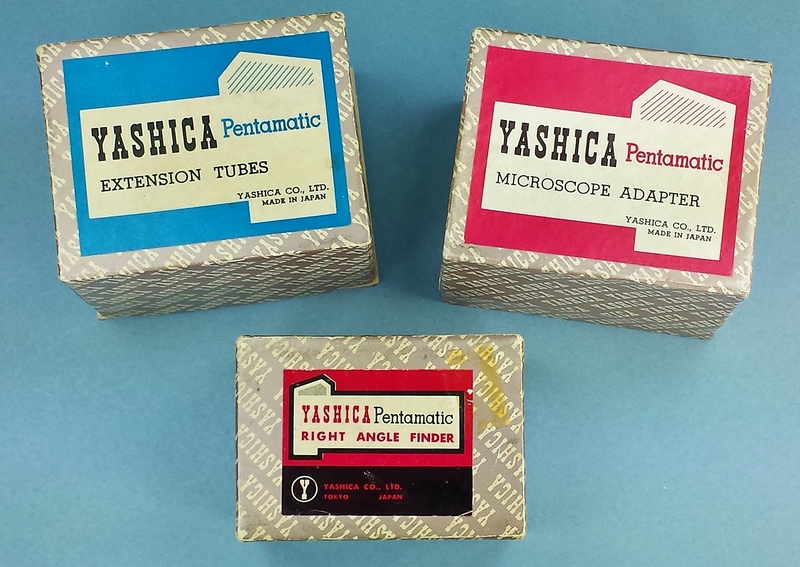 The right angle finder box appears to be from a slightly later design as it has a different look from the other two. Pentamatic ‘Extension Tubes’ mounted on our Model-S Pentamatic camera body and Auto-Yashinon 5.8 cm (58 mm) f/1.7 standard lens. The lens is super bright and is super heavy! Camera and lens weigh-in at 2 lbs 5 oz (1056 g)! Very early if not the earliest printed in the US sales brochure for the new Pentamatic. We haven’t found an earlier brochure that features the Pentamatic then this one – “Printed in the U.S.A.” on the back cover using the 234 Fifth Avenue, New York 1, N.Y. address. The cover is amazing in that other than Yashica’s name and an image of the camera, there’s no other writing. No “Pentamatic” – just an image of the camera. That was a first for Yashica as best as we can tell. The first magazine advertisement was June 1960 in the US so we don’t believe this brochure was out before that. 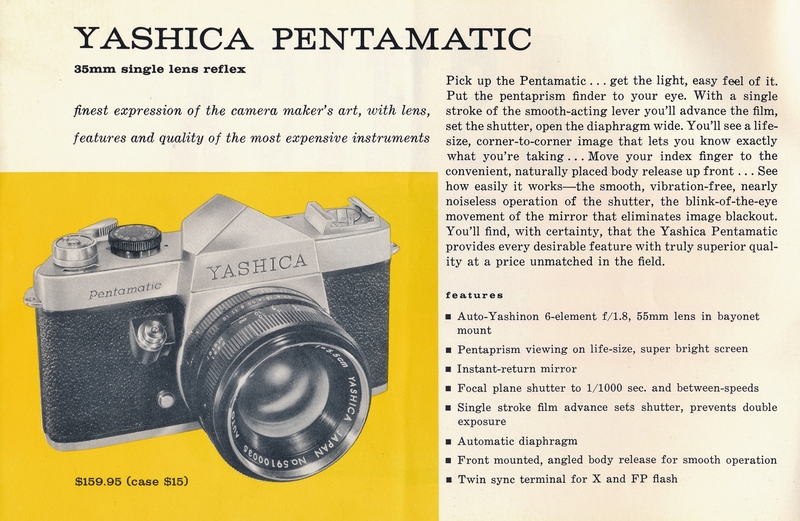 The only problem with our thinking is that most of the other cameras featured inside this brochure are 1959 model cameras and in some cases late 1958. There could even be a few that came out in early 1960. The two pages we’ve scanned (see below) contain an interesting wealth of info on the features and accessories for the Pentamatic. Of note, the lens serial number (No. 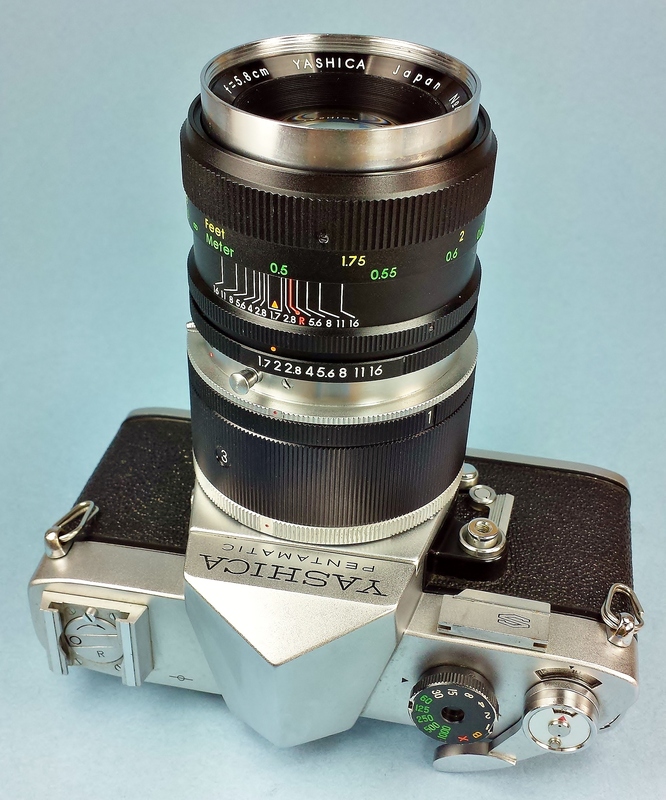 59100036) puts that lens to be one of the first lenses Tomioka made for Yashica with the new Pentamatic exclusive bayonet mount – 59 = 1959, 10 = October, 0036 = the 36th made in the production run. We know from our research that the October 1959 date for the lens is 2 full months early from the first Pentamatic bodies (December 1960). Our best guess is that Tomioka Optical (the maker of the lens) needed to start production of the standard lens early in order to meet the demand for the camera body itself. No proof exists yet but it’s the best decoding of the lens serial number we can come up. 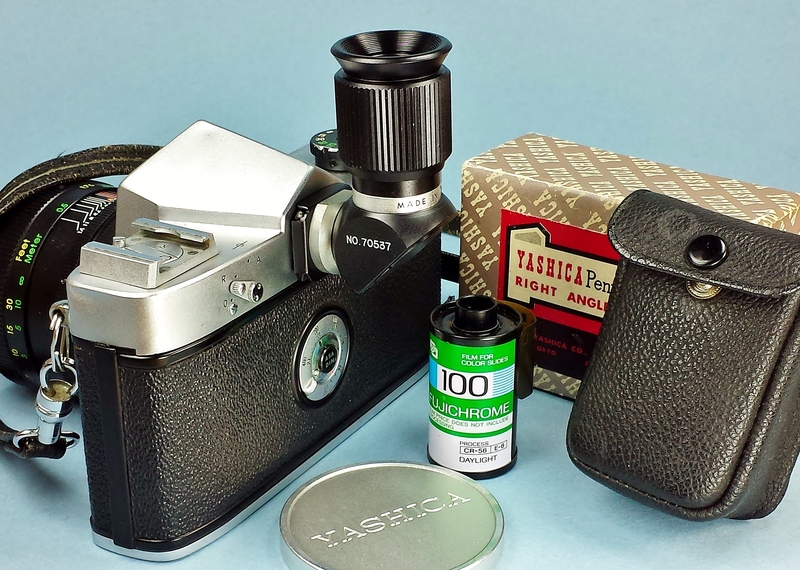 Page 1 provides a wealth of info for Yashica’s first 35mm SLR. Page 2 shows (with prices) a nice selection of accessories for the Pentamatic. 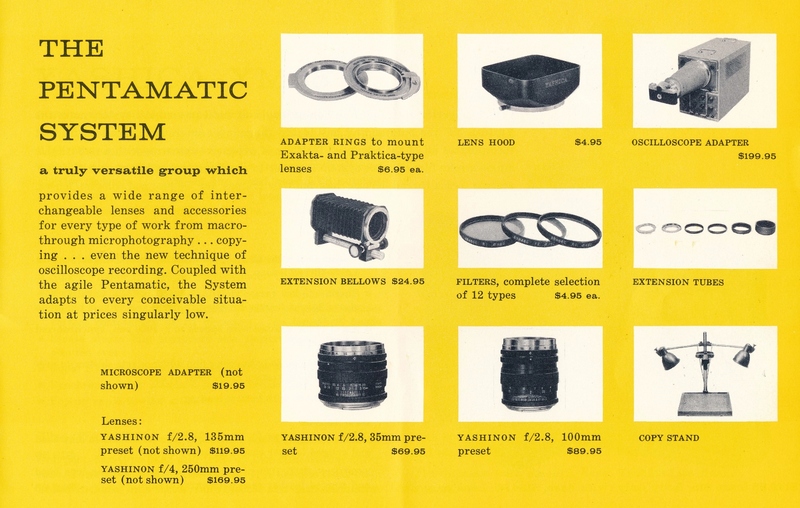 It appears that at the time of this brochure that there were 5 lenses available in the Pentamatic bayonet mount.